Media Center Furniture | Amish Originals Furniture Co.
100% American Made media center furniture from Amish Originals. Created in homes and small workshops by Amish craftsmen, Amish made media center furniture is a legacy worthy of passing on from generation to generation in your family. 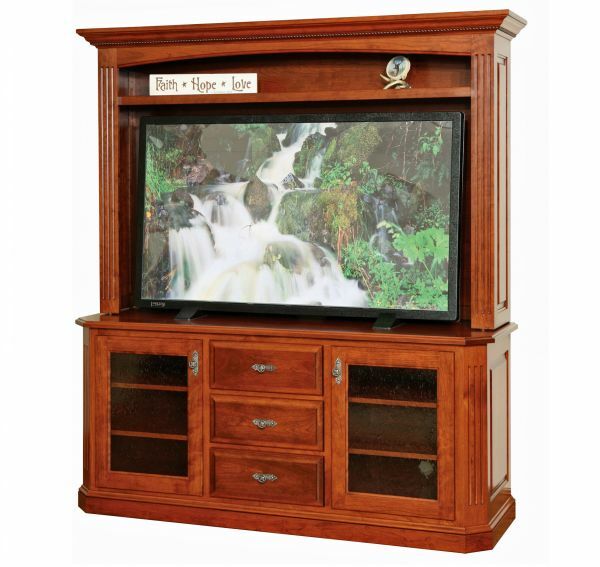 We offer high quality media centers built from American hardwoods in a variety of styles. When you purchase your media center furniture from Amish Originals, you are helping support local businesses. Amish Originals works with over 70 Amish craftsmen in Ohio who produce high-quality media center furniture in their family shops. Each piece is designed and hand crafted individually. There are no assembly lines here. When you buy from Amish Originals, you are not only getting functional media center furniture, you are also getting a work of art. We have many different types and styles of media center furniture at our Westerville, Ohio showroom. With TV stands, corner units, wall and console units, your media center can sit anywhere in your living room. When you purchase our high quality media center furniture there are no worries about it falling apart. Our media center furniture is built to last and will give your media center that something extra. Have a specific color or look in mind? All of our media center furniture is built to order making it extremely easy to get the exact look you want. Our furniture is made with 100% American hardwoods such as cherry, maple and oak. So whether you’re wanting dark, light or a more neutral look for your media center furniture we can get you the style you need. Learn More About Media Center Furniture From Amish Originals Furniture Co. Since 1992 Amish Originals has been offering high quality media center furniture. Visit our Westerville Ohio showroom where we will be happy to help you find the media center furniture you’re looking for. If you can’t make it to Westerville, browse our website for ideas or contact us with any questions you have.